After a trouble-free drive, we arrived at the Mountain Tunnel Campground in Banff National Forest in the mid-afternoon. After setting up, we drove into town to check out the Visitor Centre. It was a drizzly day and we decided to wander around town. Downtown Banff is a bit touristy, but in a nice way. We checked out several shops and had a nice, relaxing afternoon. We really only had one day to enjoy the area, so we were on the go early the next day. We hiked the trail to the top of Sulfur Mountain. The weather was off and on the entire day. 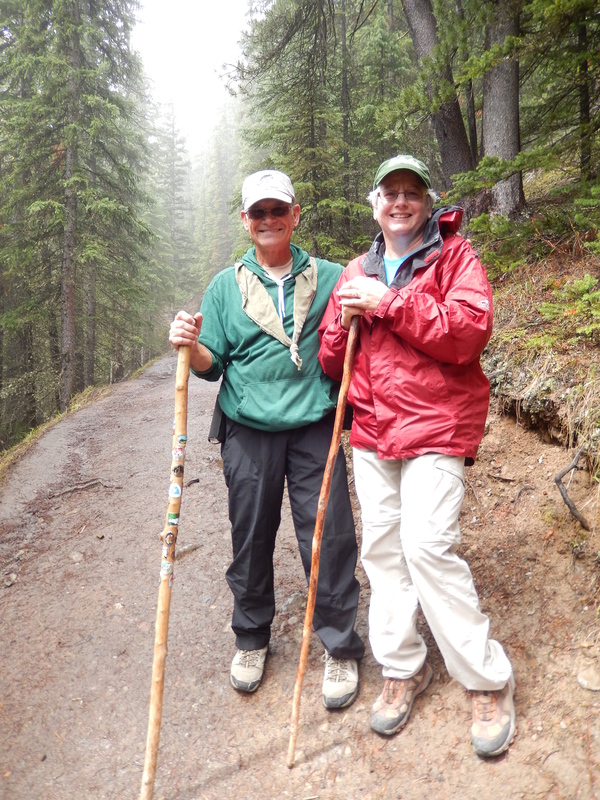 We started in a light drizzle, then it cleared, and we ended the hike in a steady rain. The hike was almost seven miles long with a climb of over 2,000 feet and we made it in two hours and five minutes. 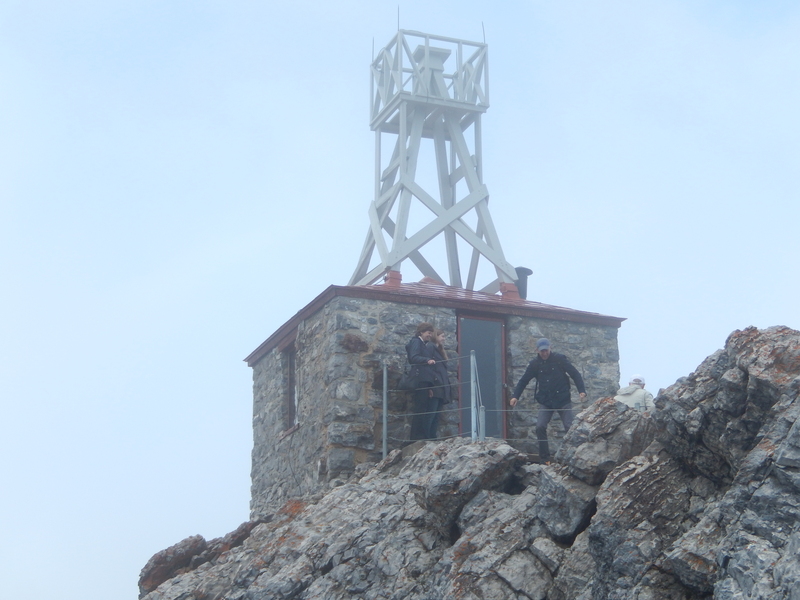 The actual summit has a weather station that monitored cosmic radiation from 1956 to 1978. A look inside revealed the harsh conditions the researchers endured. After a trail lunch at the summit, watching the clouds come and go over the mountain, we rode the gondola to the bottom. 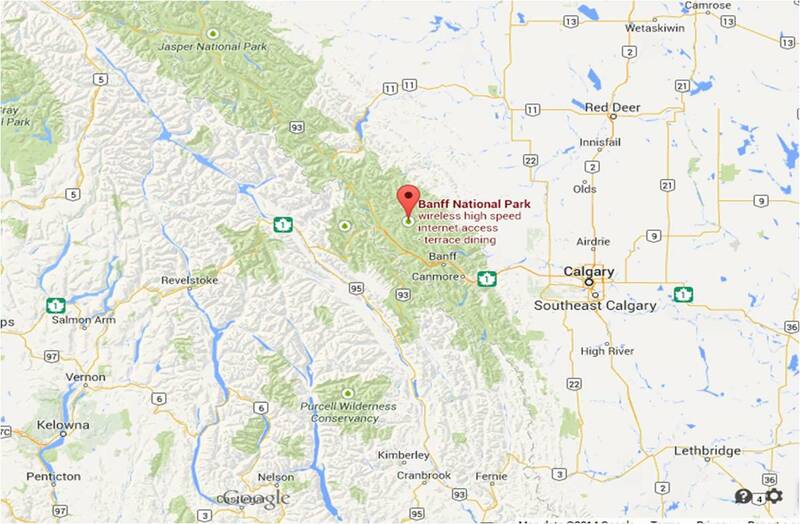 The first Canadian National Park was created within Banff National Park. 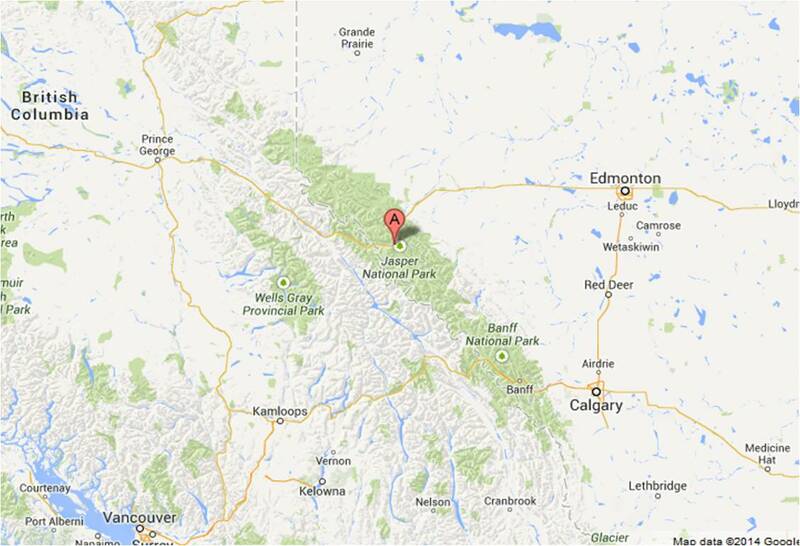 Three employees of the Canadian Pacific Railway were exploring in the area and discovered a hot spring in 1883. They tried to acquire the rights to the land to develop it. 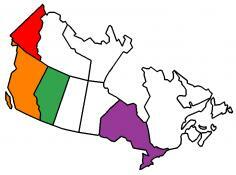 In 1885 the government decided to keep the land rights, compensate the three employees, and create the beginning of the Canadian National Park system. We strode along a walkway looking at the site of their discovery and other parts of the hot spring. The first permanent structure created by Parks Canada reminded us of the Roman baths in Bath, England. 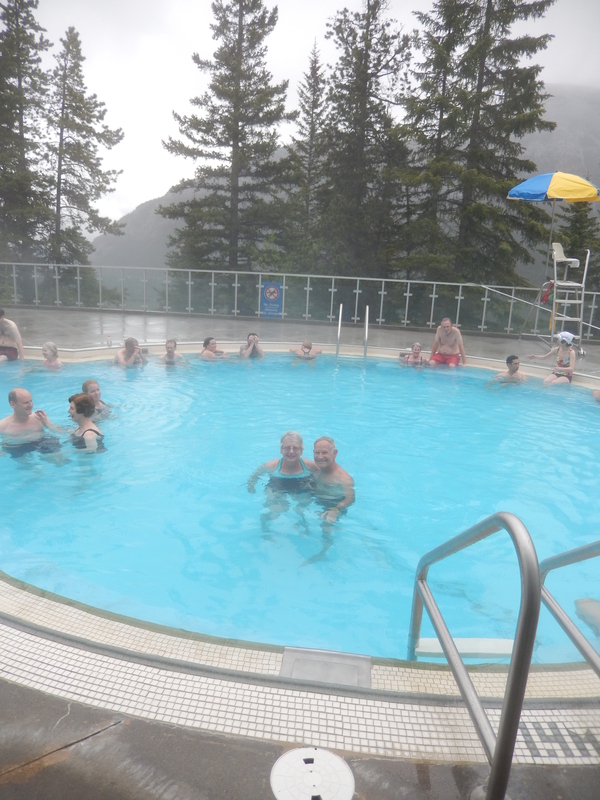 The culmination of a great day was a long soak in the Banff Upper Hot Spring. It was wonderful to sit in this huge, natural hot tub the size of a swimming pool. It felt wonderful after a busy day, it’s too bad we can’t take it with us on our travels. Tuesday, we woke up early to hear rain on the roof of the trailer, so we packed up right away and headed for Lake Louise. We arrived mid-morning and weren’t sure if we would be able to get in that early, but it was not a problem. After setting up we drove to the Visitor Centre to get information on hiking trails in the area. Not all trails were open. Some were closed due to deep snow and others closed due to grizzly bear activity (the bears had just come out of hibernation and were foraging for food). 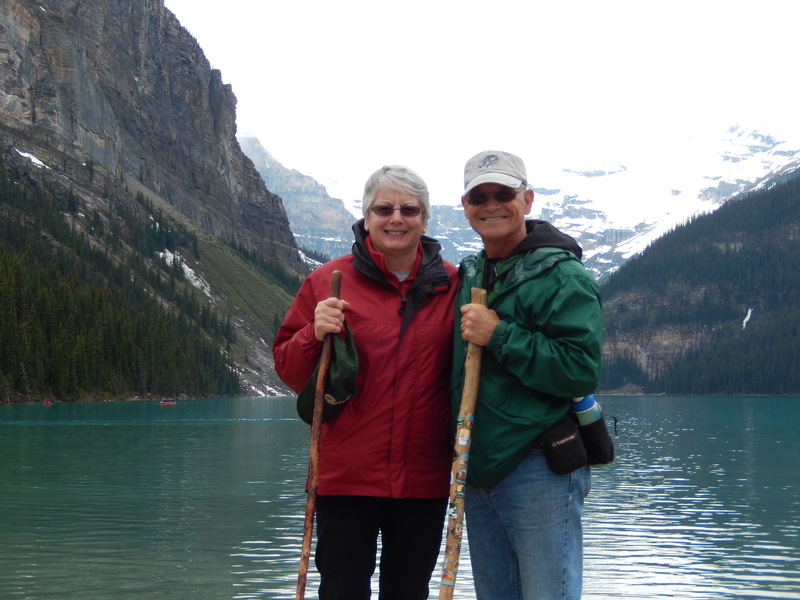 We chose to hike the Plain and Six Glaciers trail. 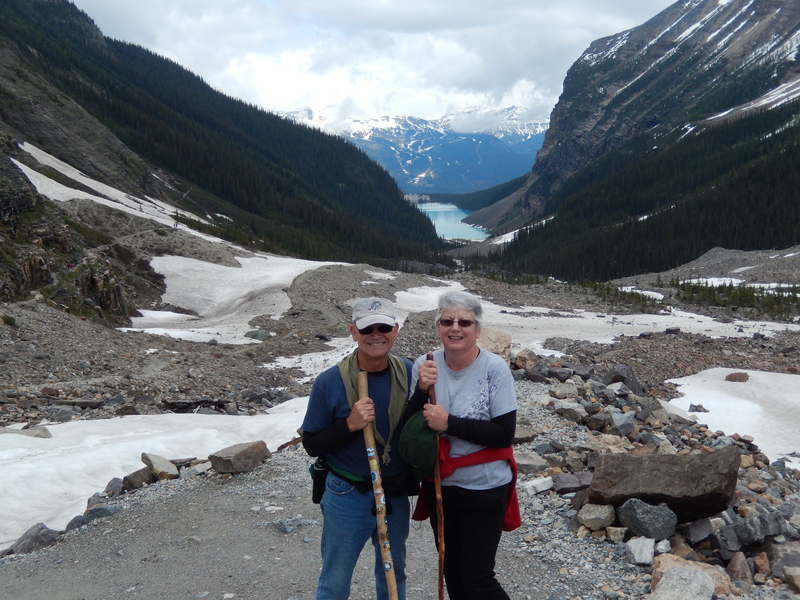 This started at the Chateau Lake Louise and followed the shoreline of Lake Louise then headed uphill toward the Victoria Glacier. The views were outstanding! The lake was a blue turquoise, caused by the glacier runoff. The temperature was cold, but at least it was dry, and low clouds covered the mountain tops. As the day went on, the sky started to clear, but we were still frustrated by low clouds preventing us from seeing the tops of the mountains. The trail was occasionally covered by snowfields that were tricky to cross. At one point we saw a father carrying his son in a backpack desperately trying not to slip and slide as he traversed the snow. At one point the trail hugged the side of a cliff that had cable attached to the cliff face to use as a hand rail. Needless to say we found the trail to be challenging. About three and a half miles up the trail we got to a point where we had a clear view of both the Victoria Glacier and Lefroy Glacier, and we decided to head back to the trailhead. On the way back we actually saw a small avalanche! At the foot of Lake Louise we wandered through the lobby of the Chateau Lake Louise. If you are looking for a very upscale place to stay, this is it! We woke up to sunshine! After so many days of dark skies, it was glorious. We took a short drive to Lake Louise to get some final pictures with the mountain tops silhouetted against a clear, blue sky. We considered a stop at the Columbia Icefield Discovery Centre an essential part of the trip. 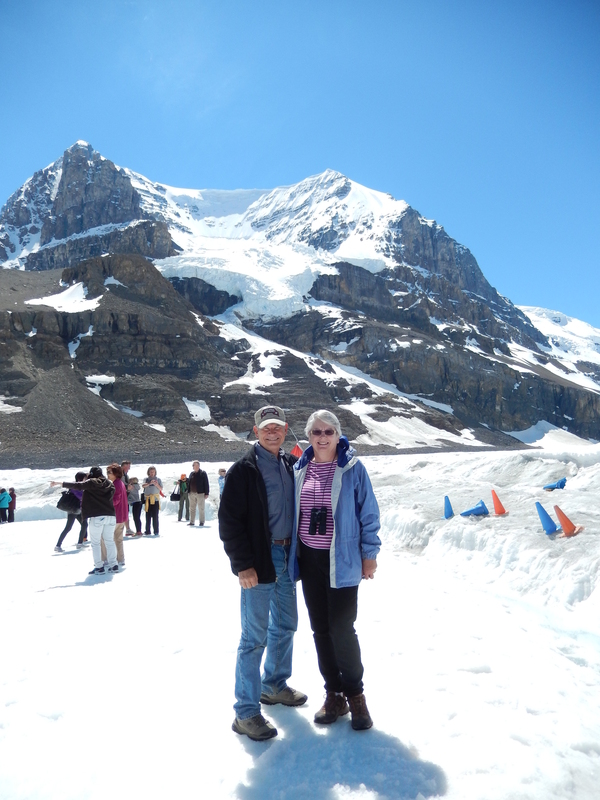 We drove up the Icefield Parkway to the Centre and then we were driven onto the Athabasca Glacier in a six-wheel Ice Explorer bus. This is the only way we could get onto an actual glacier, as normal hikers cannot go onto a glacier unescorted. There we were, standing on 900 feet of ice that had been there for thousands of years – what a feeling! After setting up in Whistler’s Campground at Jasper National Park, we drove into Jasper to get more information from the Visitor Centre. 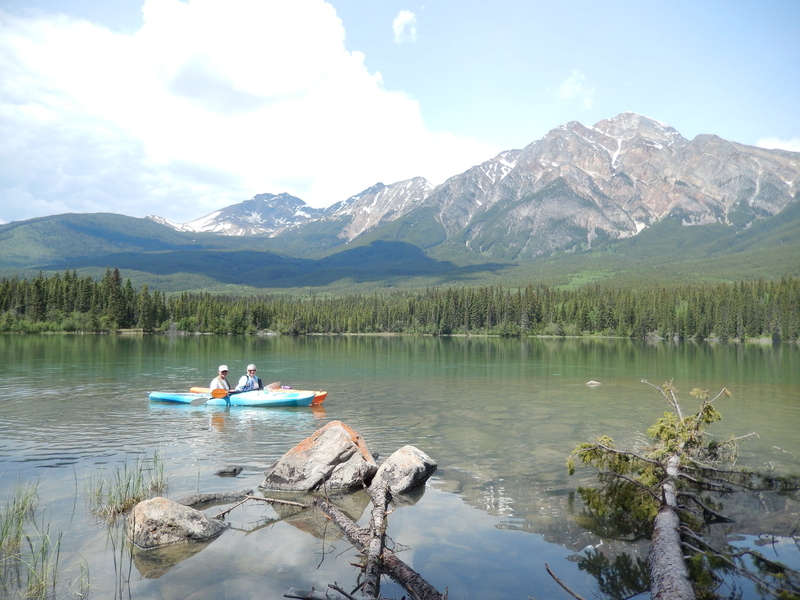 We signed up for “Jasper, A Walk in the Past.” This is a walking tour of Jasper, led by a guide from Friends of Jasper National Park. It was interesting to hear how Jasper turned from a stop on the railroad where trappers and miners would get supplies into a town of 5,000 in the winter and 20,000 during the summer. One of the oldest buildings was the Visitor Centre which was originally the Park headquarters and residence of the park superintendent. 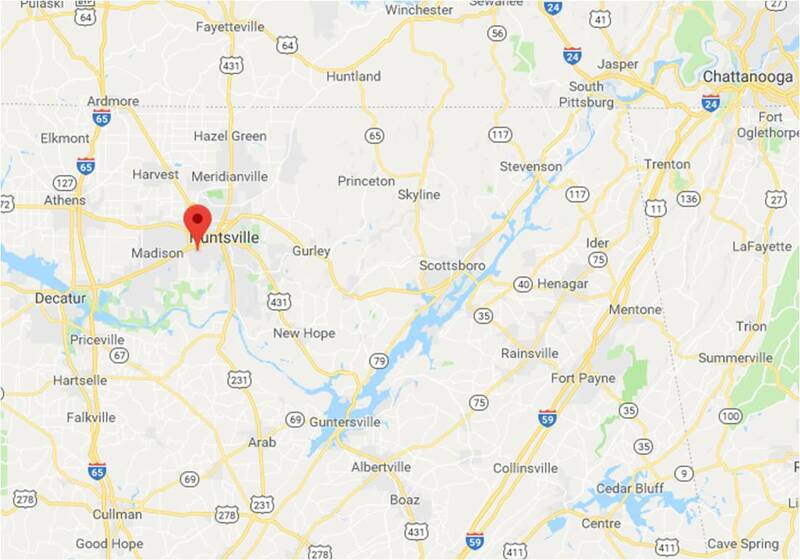 One story is that he would sit outside with his wife and shoot at any animals disturbing his garden with his shotgun. Our guide also pointed out the high fence that surrounded the elementary school. She said it was not to keep the children in, but to keep the elk out and it was not unusual to find elk grazing on someone’s front lawn. 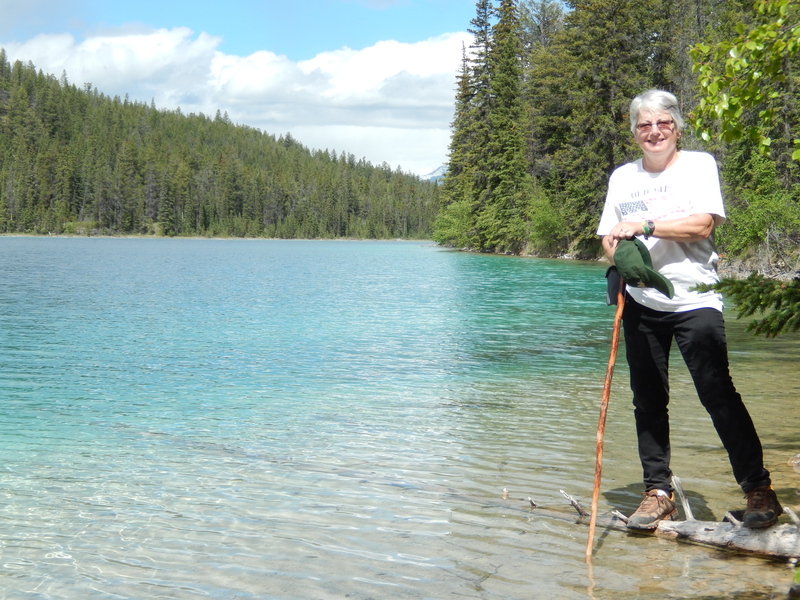 The next morning we had plans to hike a trail near Patricia Lake, but found out the trail was closed due to grizzly bear activity. Back in Michigan we never had to worry about elk grazing on our front lawn and grizzly bear roaming the woods 2-3 miles from downtown. 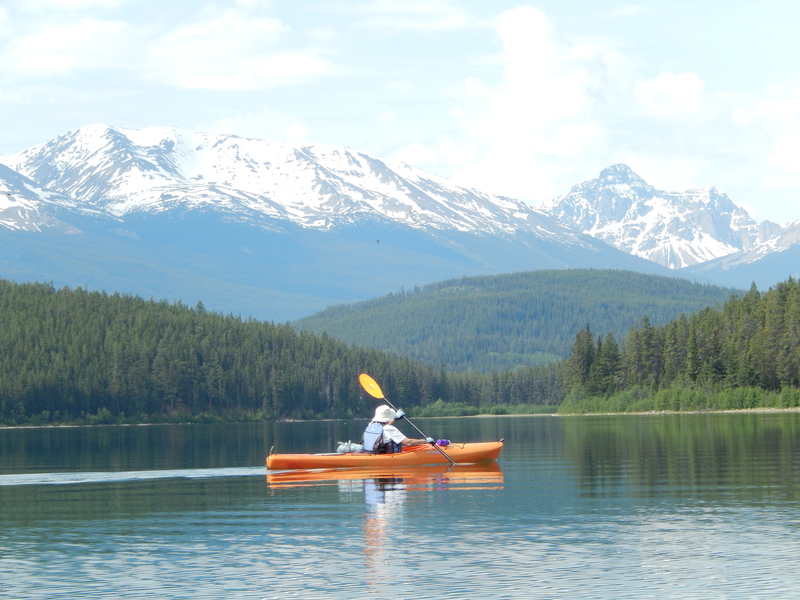 Life in Jasper is certainly interesting! During WWII there was a top secret project called Project Habbakuk to build an aircraft carrier made of ice. The prototype was built on Patricia Lake and was allowed to sink after the project’s completion. I was hoping to spot it from the surface while kayaking. Besides what better place to go kayaking with my wife, Patricia? The weather couldn’t have been nicer. We also paddled on the nearby Pyramid Lake, the reflection of the mountain on the still surface of the lake was like a picture. I could spend a month here, but it was our last day in the park. We drove south of town to hike the Valley of the Five Lakes. The weather was wonderful, sunny and warm. The trail was an easy one after the last few hikes with only a elevation gain of 396 feet. The lakes were beautiful and made the hike that much more enjoyable. I am posting this from the Jasper Municipal Library as we don’t have internet access with our mobile hotspot. 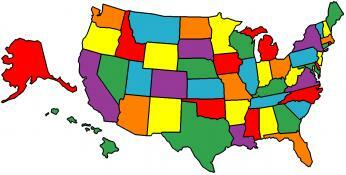 We leave tomorrow morning for our 320 mile sprint to the starting line for our RV Caravan to Alaska. Next stop Milepost Zero RV Park in Dawson Creek, BC. Because we will be traveling more than normal I will be changing the format of my posts to more of a diary or journal and will post whenever we get the opportunity. I hope you will “join” us on our Alaskan adventure. 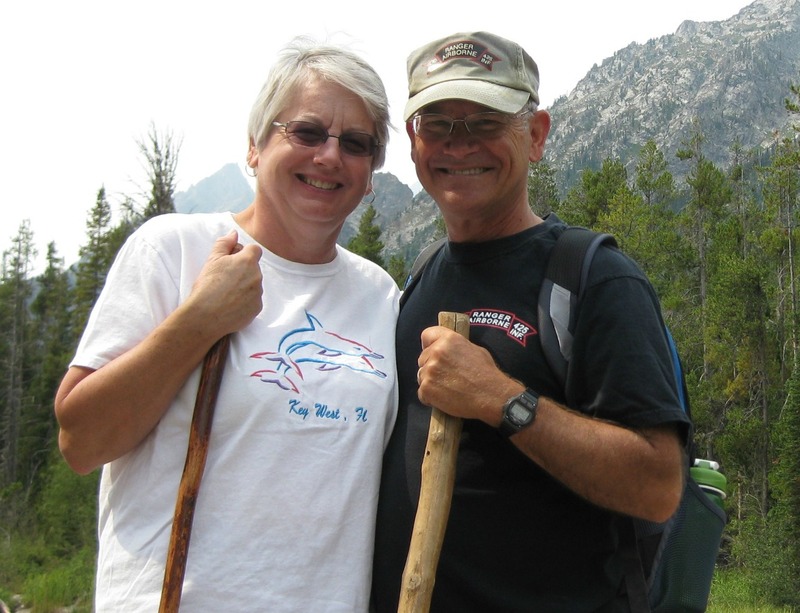 This entry was posted in Alaska RV Caravan, Canada, Fulltime RV, Michigan Traveler and tagged backcountry hiking, Banff National Park, fifth wheel trailer, full-time RV, fulltime RV, Jasper National Park, Kayaking, Lake Louise, RV Forums. Bookmark the permalink.